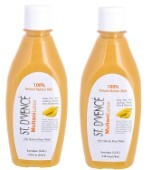 Amazon India offering ST. D'VENCÉ Multani Mitti Lotion (100% Natural Fuller's Earth) with Pure Rose Water, Aloe Vera, Kesar, Haldi, Honey, Safforn and Orange Peel Extract for Reducing Wrinkles, Acne & Pimples and Making Skin Soft, Smooth and Glowing (275 ml (Pack of 2) Rs. 299 Rs which is worth for Rs 970 at best and lowest price online. Free Shipping for Prime users or avoid shipping make cart value 499 OR Free Shipping for Prime Users. Activate your prime account trial for 30 Days.You can follow the below steps to buy this product at their deal price.Keep Visiting dealsheaven.in for more Best offers ,hot online deals, promo code, coupons and discount . How to Buy ST. D'VENCÉ Multani Mitti Lotion (100% Natural Fuller's Earth) with Pure Rose Water, Aloe Vera, Kesar, Haldi, Honey, Safforn and Orange Peel Extract for Reducing Wrinkles, Acne & Pimples and Making Skin Soft, Smooth and Glowing (275 ml (Pack of 2) ?